Head thickness determines the life span of a cutting tool in much the same way as the head shape. The cutter life is directly proportional to the thickness of the head. High precision cutters are finished so that they meet exactly at the point of the head. If you hold a good pair of diagonal cutters up to the light you should see an increasing amount of light toward the back of the cutters. Since most cutting is done at the tip, this increases the cutter life by allowing the tips to continue to meet after some wear. Larger cutters (over 5" in length) may meet along the entire blade as less tip cutting is typically performed with larger cutters. 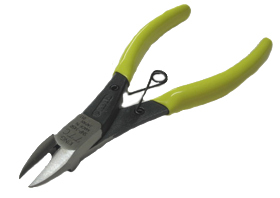 A pair of cutting pliers is a lever with the fulcrum point at the center of the joint. The mechanical advantage of the lever is expressed as a ratio by dividing length A into length B. Cutters with the largest mechanical advantage will generally last the longest. 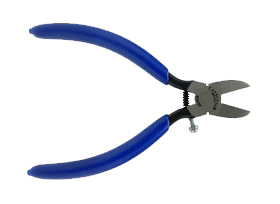 Plastic cutting pliers have one purpose, to cut plastic. Proper selection of cutters ensures that the tools you purchase will cut the plastic you need to cut, where you need to cut it and most importantly, will give you the maximum number of cuts per dollar spent. Once the physical size and shape of the desired cutter is determined by the mechanical aspects of the cutting problem, the economic justification and selection should be based on the number of cuts per dollar. The costliest mistake most often made in selecting cutters is to buy too small. It is easy for a craftsman to be attracted to tiny precision cutters under 4" in length. The number of cuts obtainable from a cutter is directly proportional to the square of the weight of the cutting head. Allowing economical considerations to put a 4" cutter where a 5" cutter would do the job, reduces the number of expected cuts by nearly half. Since 4" cutters typically cost more, the cuts per dollar spent increases substantially. The rule of thumb is always the largest cutter than can be used, should be used for the job at hand. Most manufacturers offer various cutting blades described as semi-flush, full flush, regular, etc. This refers to the angle of the blade while looking straight at the end of the cutter. Flush cutters are designed to reduce the amount of pinch left on the plastic. Flush cutters should be specified where necessary. A good rule of thumb is the greater the angle. the more cuts available from the tool. Often, pointed or narrow cutters are chosen for the same reasons that small cutters are popular, A pointed head, however, greatly reduces the expected life span of the tool. With cutters of the same size are compared, a round head will outlast a pointed head almost two to one. Pointed head cutters should be used only where necessary. This is typically when use of a rounded head cutter is impossible due to access tot he work. The more material behind the cutting blade, the greater the number of cuts that can be expected.